In the urban driven entertainment business, in the American Idol/Survivor/Joe Millionaire world we live in, when a singer songwriter gets a break of any kind, it's news. And since news per se is a little hard to generate in a scene as insulated and self-contained as folk music, breaks can sometimes have far reaching effects. They can instantly lead to better gigs, become a permanent part of someone's dossier, and a topic for discussion among the players, the business element, and the ardent fans. 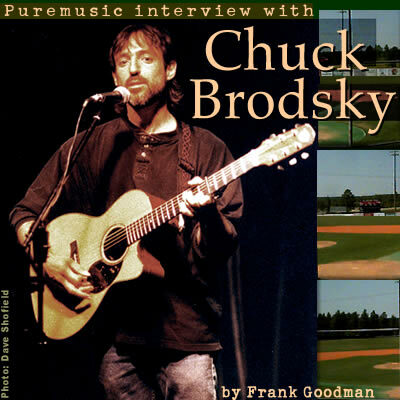 When I heard from the grapevine that the upcoming major film release, Radio, was to feature a tune by the same name on the same subject by folk singer Chuck Brodsky, it brought a smile to my face. Though I didn't know him personally, we'd met a time or two, and he was friends of friends, to understate the matter. So I checked into doing an interview with the artist, and looked forward to getting to know him a little, and getting the lowdown on how a really good folk singer got a break. It's all over the telly, so I'm sure you've seen the commercials for this new movie with Ed Harris and Cuba Gooding, Radio. It tells the story of a relationship between an Anderson, SC, football coach named Harold Jones and a mentally challenged African American youth named James Robert Kennedy, aka Radio. I haven't seen it yet, but it looks like a real tearjerker--critics are giving it a hard time and the fans are coming in droves. It was #3 this week, ironically behind Scary Movie III and The Texas Chainsaw Massacre, and in front of the amazing Mystic River. Did 13 mill on the first weekend.